The sailor and the dancer, the young girl stranded along Route 66 at dusk, the refugees who turn into ravens...Sweet Wednesday's songs spin tales that allow the listener to peek into the human soul in its most intimate and magical moments. From the moment singer/songwriters Dave Falk and Lisa Housman met, they knew there was a songwriting, performing chemistry at work. Since forming Sweet Wednesday in 2006, the duo has released four albums to critical acclaim, toured extensively as an acoustic duo and with their full band, and been featured on radio and television programs throughout the U.S. and abroad. In addition to inspiring fans near and far, Sweet Wednesday has been the recipient of several songwriting awards, including First Place in the Great American Song Contest, First Place in the Dallas Songwriting Competition, and Runner-Up in the John Lennon Song Contest. An accomplished multi-instrumentalist, Dave brings his unique style to the guitar, mandolin, harmonica, banjo, and fiddle, with a songwriting style full of humor, poetry and insight, while Lisa sings of long-distance friendships, having a hard day working as a clerk in a bakery in New York City, lost love, and those crazy mermaids you might encounter after being out on the ocean for several days. "Think about the last time you received an unexpected and totally delightful gift. That’s just how I felt when I heard the music of Sweet Wednesday. 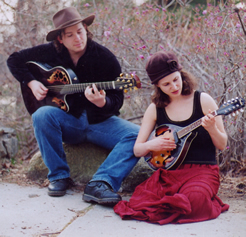 You’ll forgive the gushing when you hear the alt-country, folk, roots sound of the Boston-based duo known individually as Dave Falk and Lisa Housman. I didn’t think musicians made music this addictive anymore." "Housman truly recalls Merchant in her 10,000 Maniacs prime, and her voice absolutely soars."